It’s funny, much as I usually abhor ruts and routine, I can be quite the creature of habit sometimes. Which, in the case of visiting the San Juan Islands in the Northwest corner of Washington state, comes in the form of me heading 99.9% of the time to Orcas, dating back to trips made there with my family as far back as I can remember. Which is one of many reasons why I’m so looking forward to my visit to the islands mid-September, because it’s getting me out of that Orcas rut and taking me to the namesake of the archipelago, San Juan Island. I was thrilled when asked to be part of a special series of get-aways for food lovers, leading one of three Culinary Conversations hosted at Lakedale Resort (the other two sessions are led by two women I adore and admire, Sheri Wetherell, CEO/Founder of Foodista and passionate food writer Kim O’Donnel). 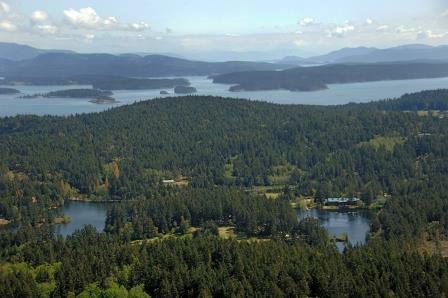 I can’t recall the last time I’ve been to San Juan Island, and Lakedale will be a new destination for me. It looks like a dreamy way to spend a few days, lakeside, relaxing, surrounded by reviving nature and enjoying the company of fascinating people. Which could include you, if you’d like to join in the fun! This is a new gathering for Lakedale, a chance to bring together people who have a similar passion for food and beverage culture for a couple days of relaxed conversations about the world of food. There are three sessions in this series, all in September. I’m leading the session September 15-17. And I’m so excited to be joined by a wonderful team of colleagues: Greg Atkinson, chef/owner of Restaurant Marché on Bainbridge Island, George and Eiko Vojkovich, owners and farmers of Skagit River Ranch, and Nathan Kaiser, owner and distiller of 2Bar Spirits in Seattle’s SoDo district. The topic I’ve chosen for the conversations those couple days is one of context, which for me is a guiding benchmark for the work I do in my writing, speaking and teaching. It’s wonderful that the Northwest is so rich with native foods and those that have taken so well to the geography and climate of the region, that’s reason enough to be inspired as a food lover. But over the years I’ve become far more enchanted by Northwest food and drink after learning countless stories behind those culinary treats. It makes cooking and eating in the Northwest that much richer, in my opinion, and I felt this could make an interesting foundation for dynamic conversations together at Lakedale. The couple days are going to begin Sunday evening with an island-style happy hour at the resort, followed by dinner. Monday’s the “meat” of the excursion, two sessions of conversation between me and my “dream team.” It’ll be easy-going, informal, and I hope it will be a dynamic conversation that engages attendees as well. There’s free time that day as well to enjoy the treats of the property and the surrounding area. Monday nights supper will be a casual but gourmet dinner that will feature Skagit River Ranch and 2bar Spirits, in the capable hands of Greg Atkinson. After dinner, a fireside chat open to whatever topic lingers from the day’s conversation, or wherever inspiration takes us. Hope you might consider joining me, Greg, George, Eiko and Nathan that weekend! It’s sure to be fun, engaging conversation, a beautiful get-away to the glorious San Juan Islands. There is a bit more information on the Lakedale site, and a quick call to the resort will provide even more details should you wish. For just $450 including 2 nights stay and meals, it’s such a screaming deal. And I promise we’ll have a great and delicious time.